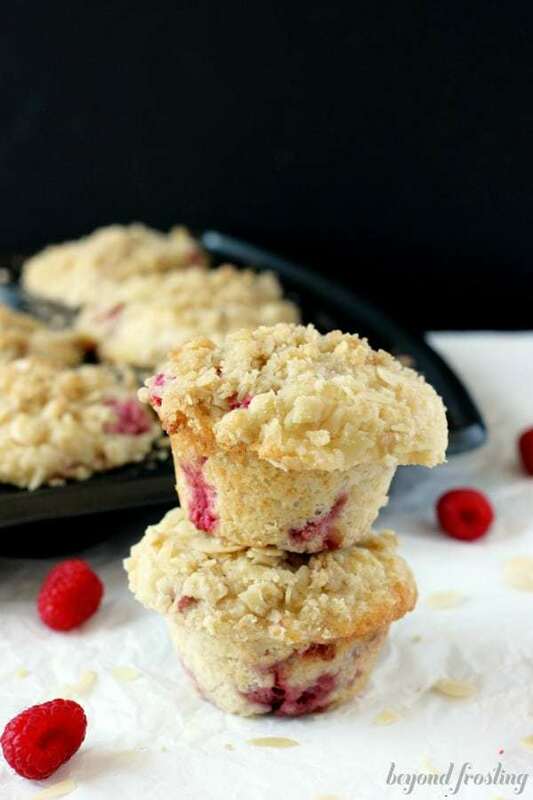 These bakery style Lemon Raspberry Almond Muffins are bursting with flavor. 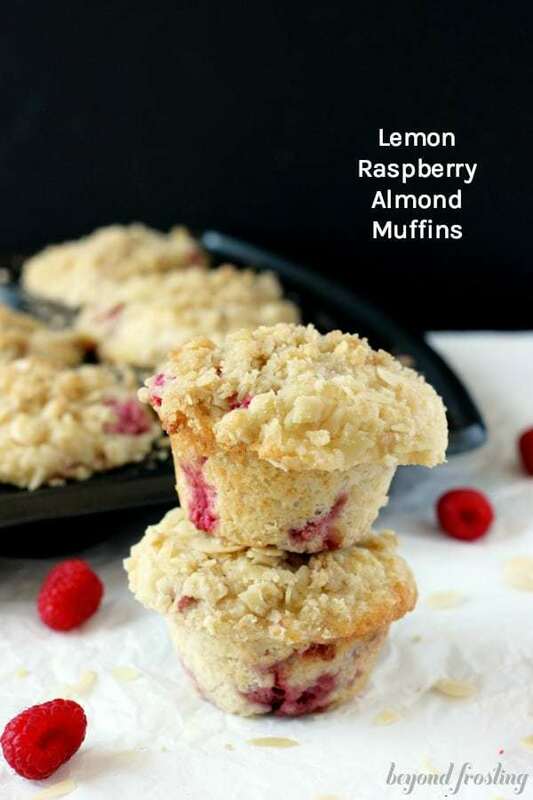 With fresh squeezed lemon juice, fresh raspberry and almond flavor, this combination makes the perfect summer muffin. 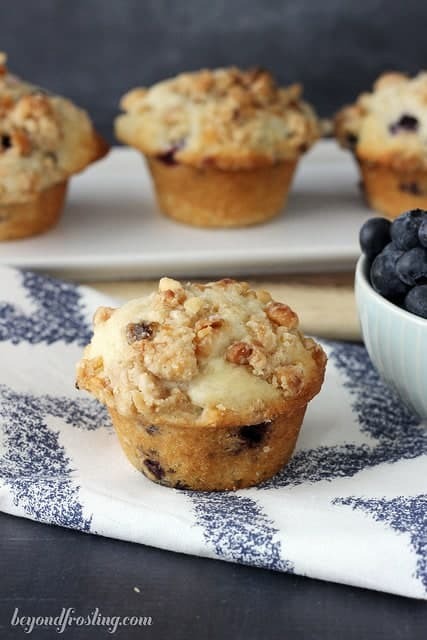 These homemade muffins are finished with an almond streusel on top. I’ve given you a few muffins recipes on this blog now, but this one, I have to say, is my best one to date. 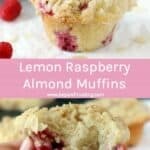 These Lemon Raspberry Almond Muffins are the best compliment of flavors that I could put together. The almond flavors come from both an extract and sliced almonds in the streusel. 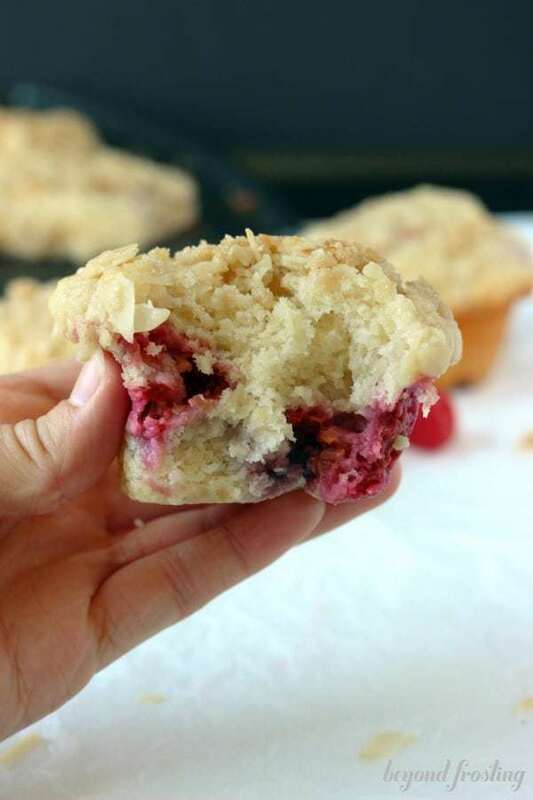 There is fresh squeezed lemon juice in the muffin batter and fresh raspberries mixed in as well. This muffin batter is one of my favorites because it’s very versatile. It’s made with buttermilk and sour cream, which means they are extra moist, even a couple days after they are baked. 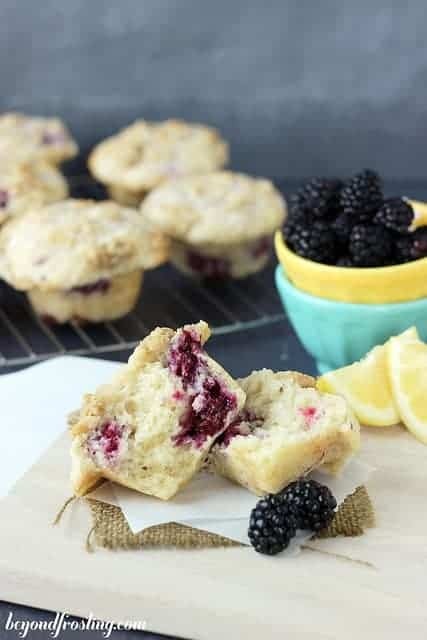 I’ve made this recipe with blackberries, an apple version and even a gluten-free raspberry muffins. Whenever I add berries to this recipe, I always coat them in a little bit of flour. This helps prevent them from sinking to the bottom of the batter. Raspberries are my favorite berries to bake with because they add texture & moisture but they really retain the tart flavor. Plus, are they not the prettiest? Whenever they go on sale at the grocery store, I tend to stock up. I always prefer to top the muffins with some sort of streusel. 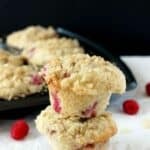 It adds a nice texture to the muffins which are so soft and fluffy inside. 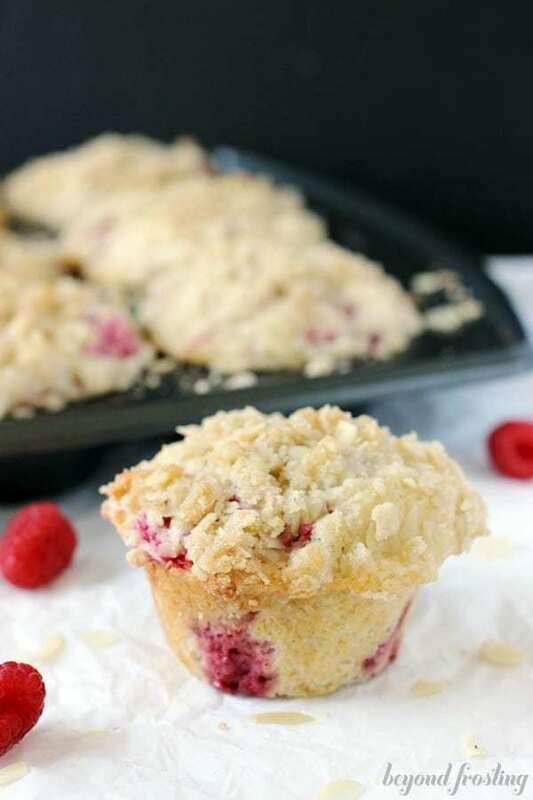 These Lemon Raspberry Almond muffins are topped with a buttery almond streusel. A simple combination of brown sugar, flour and almonds is all it takes. 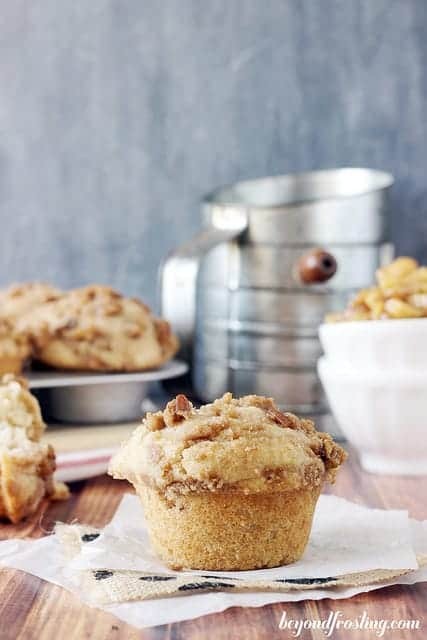 The secret to making these beautiful muffins is to fill each muffin to the top with muffin batter. First you bake these muffins at 425 degrees for 5 minutes which helps get that nice high rise- you’ll notice there’s plenty of baking powder in this recipe. Then reduce the oven temperature to 350 degrees and bake them for the remaining time. Yes, it will take time for the oven to decrease in temperature but that it the way this recipe is designed to work. This will produce 12 large muffins, and as you can see in the background, they rise nice and high above the top of the pan. If you need a higher yield, then do not fill the muffin pan all the way to the top, and of course you’ll need to adjust the baking time accordingly. Wash and rinse raspberries under water and set aside in a small bowl. In a medium sized bowl, sift together flour. Measure ¼ C of the sifted flour and pour over raspberries. Gently stir to coat the raspberries in flour. In a medium size bowl, beat the egg using a whisk until light and fluffy. Add melted butter and whisk together with the egg. Continue to add almond extract, buttermilk and sour cream and whisk everything together until smooth. Slowly pour wet ingredients into the dry ingredients and use a wooden spoon to mix just until combined. Your batter will be thick, but careful not to over mix! Lastly, fold in the raspberries.